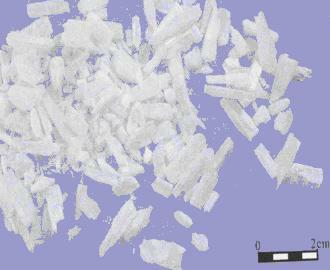 One mineral with hydro calcium sulfate fibriform crystallized polymeric. Mainly in Hubei, Gansu and Sichuan provinces of China. 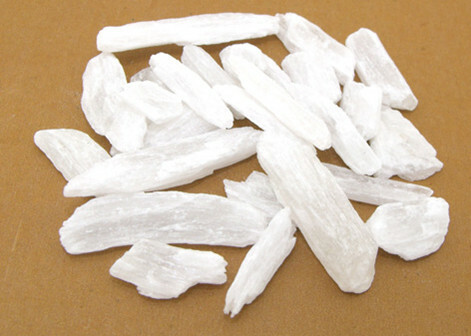 Big size in white with loose texture, translucent and silky cross section. Use the crude or calcined one, smash it and remove the impurities. Pungent and sweet; lung and stomach meridians entered. Clear heat and purge fire (clear the excess heat at qi system and clear the excess heat of lung and stomach). The calcined one is externally used for drying dampness and healing the sores. Being extremely cold in nature with the actions of clearing the excess heat at qi system, it namely expels the exterior heat and purge the interior fire of lung and stomach, and is specially good at clearing pathogenic heat and inhabiting hyperactivity of yang. It is mainly indicated for qi system syndrome of warm diseases which is caused by pathogenic warmth going inward and accumulating interiorly manifested as high fever lingering, sweat, restlessness, thirst, surging and big pulse. For this syndrome, it is combined with Zhi Mu in Bai Hu Tang with the action of clearing excess heat at qi system. For warm diseases due to the warm pestilence invading inwardly, it is combined with Jin Yin Hua and Lian Qiao to achieve a better effect. For qi and fluids are consumed manifested as instant thirst, it is combined with qi-tonifying and yin-nourishing herbs to achieve the effect of nourishing yin and tonifying qi while clearing heat. In the formula Bai Hu Jia Ren Shen Tang from Shang Han Lun, the heat-clearing herbs are combined with Ren Shen, etc. For severe dyspnea cases caused by heat accumulating in the lung, it is combined with dyspnea-relieving herbs for its action of relieving dyspnea is respectively weak. For instance, in the formula Ma Huang Xing Ren Gan Cao Shi Gao Tang from Shang Han Lun, it is combined with Ma Huang, Xing Ren. For cough due to phlegm heat, it is combined with lung-clearing and phlegm-resolving herbs and cough-stopping herbs. For gum red, swollen and painful, or gum bleeding, even rancid canker with smelly breathing, or sore mouth, pain in the face or headache, sore throat, thirst caused by the accumulated heat going up along the meridian, it is combined with stomach-clearing, toxicity-removing, and sore-throat-relieving herbs. For instance, in the formula Qing Wei San from Lan Shi Mi Chang (Secret Book of Orchid Chamber), for malnutritive tooth, gum bleeding, sore mouth with smelly breath caused by stomach fire and toxicity, it is combined with Huang Lian, Sheng Ma. In the formula of Xiong Zhi San from Ren Zhai Zhi Zhi Fang (Effective Prescriptions from Renzhai House),for pain and distention of head, it is combined with pain-stopping herbs such as Chuan Xiong, Bai Zhi. In the formula of Qing Yan Li Ge Tang from Bai Hou Quan Sheng Ji, for sore throat, it is combined with sore-throat-clearing herbs such as Niu Bang Zi, Bo He. In the formula of Yu nv Jian from Jing Yue Quan Shu, for diabetes, it is combined with yin-nourishing and fluids-generating herbs such as Shu Di Huang, Mai Dong, Zhi Mu. When the calcined Shi Gao is externally used, it is good for healing the sores by drying the dampness, decreasing the secretion and promoting the wounds healing and indicated for constant unhealing sores, eczema and burns. It can be used by itself or be combined with other heat-clearing and toxicity-relieving herbs or dampness-drying and sores-healing herbs. Commonly it is used as excipient or liquefier when other externally-used herbs are made. For instance, it is seen in Jiu Yi Dan from Yi Zong Jin Jian (Golden Mirror of Medicine). Smash priorly, decoct 15~60 g. If orally taken, the crude one is advisable. The calcined one in powder is suitable for external use.